“February 23 marks 1000 days in prison for Bradley Manning – a young gay man locked up for allegedly leaking the scandolous U.S. diplomatic communications published by Wikileaks. 1000 Days. You have read that correctly. 1000 days in prison for saying something he saw was wrong. So much for that speedy trial clause in the 6th Amendment: “[i]n all criminal prosecutions, the accused shall enjoy the right to a speedy . . . trial . . . .” People argue that what Bradley Manning did has put lives in danger. Whose lives have been put in danger? The people who committed the war crimes, those responsible for the death of innocence? Nope, they are not the ones who have been sitting in a jail cell for 990 days. They are not the ones who had to endure 11 months of solitary confinement and torturous conditions under a Peace Prize Winning Presidents Administration. Bradley Manning is not a terrorist, nor did he “aide the enemy”. 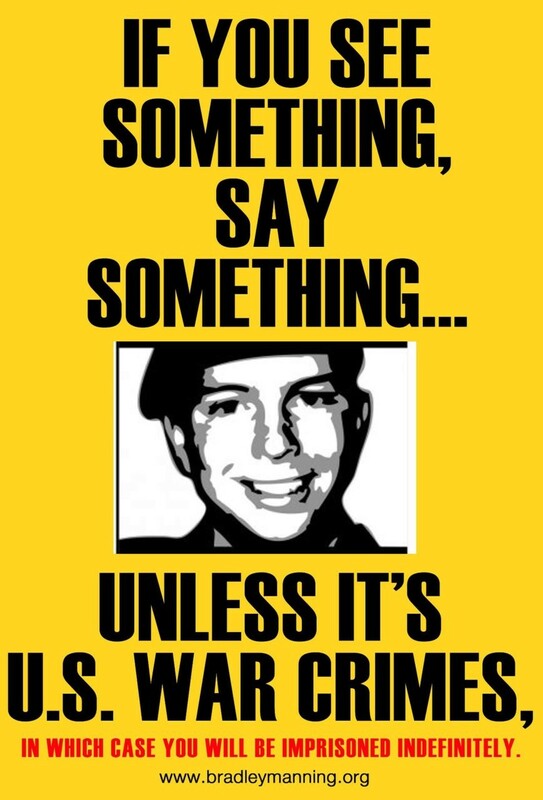 Bradley Manning did what the U.S. Government begs people to do; Say Something when you see a crime happening. Manning did not sell these leaks to foreign governments, or terror groups, he released it to the public so in his words, it would create “worldwide discussion, debates, and reforms”. 990 days after being imprisoned the discussion has died down, the debate is no where to be found, and reforms are not on the horizon. What Bradley Manning exposed can not be ignored, and we must keep fighting for transparency from an Administration that promised peace, and transparency. If we have learned anything from the attacks on Whistleblowers, this Administration does not want the public knowing what they are doing in our names.